La Rochelle's old port, celebrated towers, monuments, beaches and parks will captivate you. La Rochelle, also has a lovely area for pedestrians, a European fishing port and marina, a university, museums, and wonders to discover. 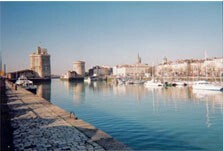 Fishing, commerce, and pleasure cruising make La Rochelle one of the most compelling Atlantic passages. Today, its four ports make up one of the largest port authorities, tourist, and economic sites in France. All of this without taking into account its cultural openness with the francofolies, international film festival, Grand Pavois, numerous museums, aquarium, and, of course, rugby and sailing. La Rochelle also means taking time to relax and enjoy life; taking advantage of seaside promenades, parks and gardens, strolls in the old port, stopping for an ice cream and relaxing on sunny terraces. La Rochelle is as welcoming as it's inhabitants. To get started with your appartment ou house hunt, we invite you to contact the buyer agency COTE ACHETEUR La Rochelle for evaluation of your needs. Armed with knowledge of the department and the real estate market, your buyer agent will provide choices that correspond with your demands and are in keeping with the local characteristics. Prefecture of Charente Maritimes ; The city houses. the departmental administrative bodies and infrastructure. You'll love walking around the Hôtel de ville a pedestrian area great for walks with cobble stone streets and quaint shops. This is the heartbeat of the historic city. with its welcoming restaurants and terraces, is where you can see the 'francofolies' in July, and, under the Grosse Horloge, find the court of des dames offering the wares of its local artisans. a village inside the city and historic fishing area, you'll find yourself among friends in the cafes and wine cellars. On the other side of the canal, you'll find a market selling fish and early fruits and vegetables that dates from the 19th century and is one of the city's 'must do' sites. It is a promenade in the heart of the historic district on neighbourhood streets with charming hints of the architecture of days past. with its beach bordering one of the loveliest areas in La Rochelle. It is one of the most residential and greenest areas in the city. It hosts numerous parks and gardens as well as the casino. Lastly, there's the Minimes quarter. It is a picturesque wooded city where young university students live. L'ILE DE RE, connected to the mainland by a toll bridge, protected nature reserve, sandy beaches, ostrich farms, ports in the 'rétais' spirit. CHAELAILLON PLAGE, residential city with a lovely sandy beach, casino and a Thalassos spa offering 'Thalassotherapy'. ILE D'OLERON, abundant wild vegetation, beautiful beaches, more lovely than the Ile de Ré with a free access bridge. ROCHEFORT, landlocked and bordered by a canal and known for its Royal Corderie. And a multitude of other places to discover..